Before I became addicted to Modcloth, I was already searching for more classic and demure looks. Last St Patrick's day (2013...just about the time I began my affair with Modcloth and vintage) I went shopping for a green dress and had surprisingly a hard time. I ended up going to Express, which is one of those stores I either like a lot or ignore for a year or two at a time and don't think twice about it. They had several fit and flare/skater dresses for sale including a green one. I decided I liked them because while fit and flare is definitely on trend lately, it's also a classic look with the higher waists, classic cuts, and a feminine structure. 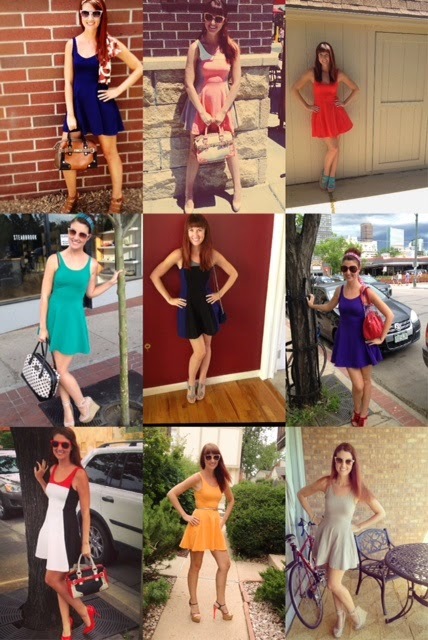 As the temperatures began to rise in Denver I invested in several more because I thought the fabric and quality was excellent, knew they'd grow with me, are easy to style as they are basically colorful blank canvases, and are easy to layer with tights and a cardigan to wear through colder seasons. Plus I'm the type of girl where if I find something that works I'll be loyal and get it in every color because I know what I'm getting. Luckily Express has sales frequently and is always sending me $30 off coupons in the mail!! As I've been posting them via Instagram for some time now lemme share a few outfit details and back stories behind why I wore a few of my more favorite looks now! Lunch date with a friend. This is easily my favorite picture of me while wearing one of these Express dresses and is possibly my favorite styling of one as well! This dress is from this year but sadly they only made them in a few colors and didn't continue to pump them out throughout the season. Luckily I became gaga for navy over the past year though so I was beyond stoked to get the dress in this color! I had a vision in my head of pairing my brown scarf and bag with it but didn't have a great summer shoe to go with it. I have classic brown pumps and if you follow me at all you know that they're my #1 go to shoe style, but with the scarf the outfit felt more bohemian so I wanted a more "summer-y" shoe. Then I went back to the east coast in July and while my mom and I were shopping I found these Nine West wedges so voila! I really do wear a lot of scarfs with these outfits, do I not?? What's fun about these dresses is despite the demure cut, they are total leg dresses! So paired with these particular shoes that place me at 6ft tall, I don't really need to do much else to feel stylish! (My 5'8" guy friends really don't appreciate it when I wear these bad boys!) Despite that I could have gotten away with the fun simplicity, the glasses match the shoes, the scarf matches the dress and adds a little yellow to it (note to self: I need to get better at taking close-up outfit details pictures!) and the Kate Spade bag is an exaggerated match with the different beige. Plus it mixes the prints of stripes and polka dots!! I love skater dresses at Express! What's funny is it's always a store I've always skipped too. I also first discovered fit-and-flare dresses at Express before my "affair" (as you call it!) with ModCloth started... I think I already said this on Instagram but I have the red/black/white colorblock one and I love it! One of the great things about it is that it can be dressed up (I also wore it with red pointy heels, great minds think alike!) or dressed down with flats. I love that the material is stretchy and breathable. You couldn't have picked a more perfect bag to pair with that dress by the way, same exact colors, haha. Love all the other colors too!